inside inner end of axle housing needs to be removed prior to removing the axle.Wanted to know what others have done to replace the inner seal. Small leak outer end of axle shaft and will replace outer seal G10346 if I decide to take things apart. Why do you think the the inner seal has failed,is there oil leaking out on to the wheel?,if it is it would be the seal,if it's leaking out of the brake housing it's a different problem. Very slight leak out the end of the right axle shaft. Just enough to collect dirt on the inner wheel. It has leaked for a long time just thought I would take the time to make repairs since being retired I now have the time. Make sure that the the transaxle is not over filled as its a fairly big job to pull the trumpet (halfshaft housing) to replace the inner seal,the bull gear retaining nut has to be removed,the bull gear stays where it is while trumpet is removed,then the shaft is is removed from the trumpet,to gain access to the inner seal,no doubt the bearings will need replacing due to age as well as the outer seal,do not depend on the hydraulics to hold the machine up while you work under it bock it up securely on wood or proper stands that can carry the weight,straight forward job with no special tools required only muscle and common sense . 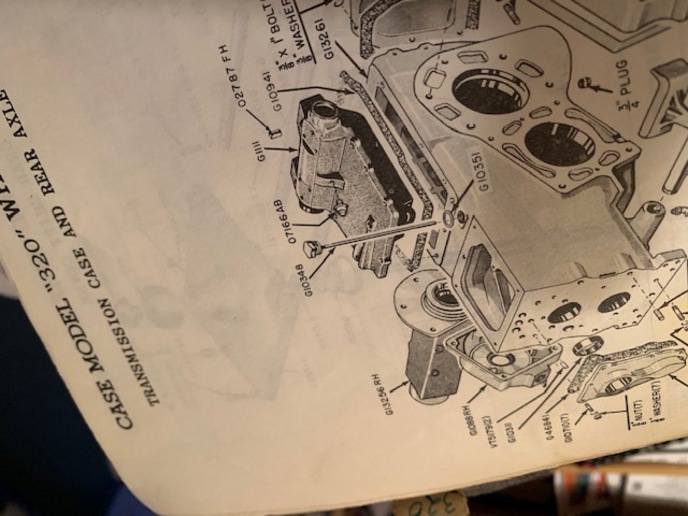 The E series machine was about 85 to 88, all the machines from the start used the same/similar Case transaxle up to about 88 when the 580K changed over to Carraro, I would not worry about the grease zerk some had and others had not,your slight leak,take the weight off the wheel,check the bearings by trying to rock the wheel with a long pry bar,if you feel any play you can adjust it by that nut on the inner end of the shaft,check the transaxle for any breather it may have and make sure they are not blocked,you may feel I am trying to discourage replacing the seal,I am,if it's a little leak and unless you are roading the machine a lot it is unlikely it will cause a problem,if it's a bad leak it will have to be done,it's an awkward rotten job. I Was thinking about picking the wheel off the ground and rocking the wheel to see if there is any play in the bearings. Great idea about tightening the inside large nut. 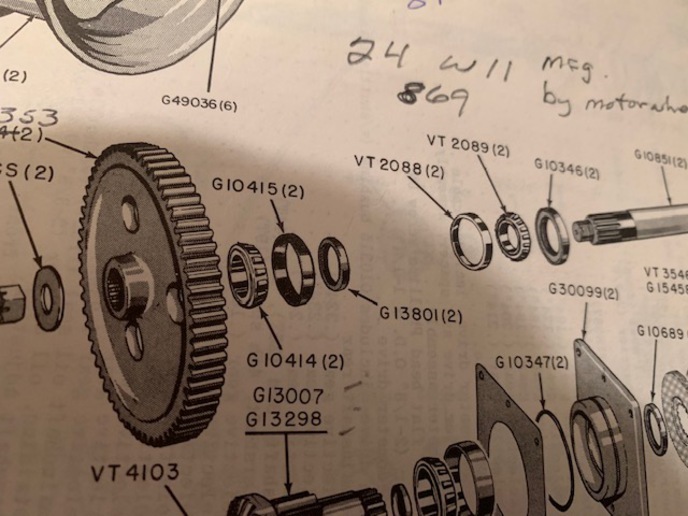 Leak is very small, just noticed several years ago that inside of wheel and outside of axle housing is dark from small amount of leaked 90wt. We have two places 12 miles apart. Just sold the ond place so no more need to move the tractor. I always had it hauled just to be safe. Notice that most of the newer backhoes generally drive down the road at considerable speed. Thanks again for your knowledge. Don't know what part of the US you live but we live in Seattle, Wa. and have some property in the San Juan islands. Tractor is at out place on the island. 100 miles from where we live. I will check play in the rear wheel bearing next time I am on the island. I am the other side of the pond London UK, such a little leak is not worth bothering about and a machine with that amount of years done is entitled to have a few leaks it stops them from rusting,lots of French built Case backhoes here,used a lot by owner drivers doing the never ending utility work around the city,I come in contact with them being in the repair business since your machine was new way back. Yes JCB is made here, no I don't own any machinery anymore,the Ferguson TE20 (TE means tractor England) would have been made in Coventry England by the Standard motor company,it should have the Standard engine with Lucas electrics but things get changed around as parts get hard to find,the TO (tractor overseas) series would have the Continental engine,Ferguson has a big following world wide,there are several forums on line,do a Google and it will bring them up.